A natural born artist, T. C. Newman spent 33 years developing a method using light and clay that decoded the formation of a three dimensional sculpture of the image imprinted on the Shroud of Turin. This method unlocked unknown information to the world. It took a lifelong passion to bring this new information to light. "Follow the Light, the Shroud's Revelations" is the story of T.C. Newman and her daughter, Jessica, as they worked together to determine how the image on the Shroud of Turin was actually formed. The project began as the result of their watching a special on television of the first photographs taken of the Shroud in 1898, and the startling image revealed in the negatives of those photographs. Jessica, then aged eight, wondered if the Shroud itself were a photograph. She and her mother discussed how a photograph was made, and they set out to see if that were the case. They started their studies using Jessica's Ken doll to see if they could duplicate the shadows cast on the face on the Shroud. This project, which continued on and off for over 30 years, resulted in sculptures made by reflecting light on the clay figure and carving out or adding in clay to reflect the negative image of the Shroud. Newman's account of her and Jessica's attempt to solve the mystery of the Shroud is a fascinating tale. The development of the theory from the first impressions through to the actual painted image at the end of the text is clearly described with graphic images added to help the reader follow each process. I enjoyed the interplay of mother and daughter as they discovered the way the light source could be duplicated and the description of the sculpting process. This book is well-written and documents an illuminating project from its inception through to some startling conclusions. 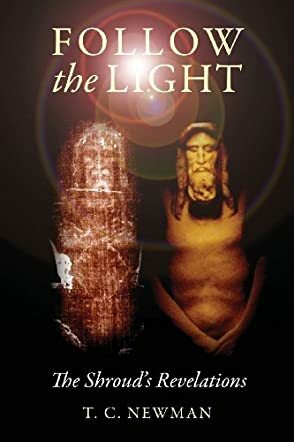 "Follow the Light, the Shroud's Revelations" is well worth reading and quite thought-provoking. “What information can possibly be new, regarding the Shroud of Turin, that is not already out there?” So opens T.C. Newman’s provocatively engaging exploration, and so, too, might be your question upon first picking up "Follow the Light". So much has been written about the Shroud of Turin, good, bad, and indifferent, that you might wonder who could possibly come up with anything different? Well, T.C. Newman has done just that. T.C. Newman is an artist, and over a period of thirty-two years she explored and documented not the history or even the theological efficacy of the shroud, but the mechanics of how the image occurred. Past studies explored what the shroud is not. "Follow the Light" narrates Newman’s inquiry into what the image is, why the image is there, and why it appears in the way that it does. Triggered by a television special on the Shroud of Turin in the 1980’s, Newman commandeers her children as research assistants as she uses everything from clay figures to copy machines to get at the root of the mystery. In the conclusion of her book, T.C. Newman flatly asserts, “Anyone who still doubts this work, but knows how to work with clay, and has artistic talent, can duplicate the sculptures by using the follow-the-light method and create the same three-dimensional figure of the man of the Shroud.” Once you have finished reading "Follow the Light", you may want to go off and do just that.